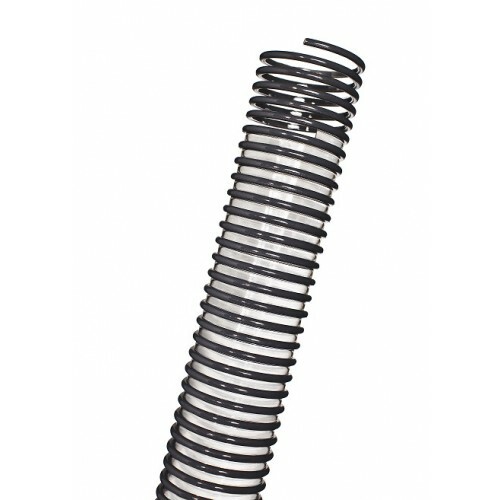 Technical Features: Ester based Polyurethane duct, reinforced with an anti-shock PCV helix. It keeps high flexibility even at low temperature. Completely smooth inside to ensure optimization of flow properties and corrugated outside. Wall thickness from 0,8 to 1,00 mm. Properties: High mechanical properties, really good resistance to abrasion and most chemicals.Halogens free and conform to RoHS as well as phthalates free. Suction and transport of abrasive media such as pellets and granules. Finds optimal application in the plastic and ceramic Industry. Can be used also in woodworking under severe conditions and when a very good resistance to abrasion is required.